Providing you the best range of fluoropolymer coating rollers and flexographic printing roller with effective & timely delivery. 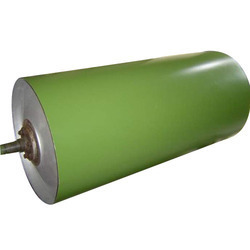 Our organization is engaged in offering a comprehensive range of Fluoropolymer Coating Rollers, PTFE roller coatings or PTFE Non-stick Coating Roller Coatings that has excellent non-stick properties. These materials have the highest operating temperature of any fluoro-polymer and can operate at 260°C and have extremely low coefficient of friction coupled with good abrasion and chemical resistance. We provide coatings in either single or two-coat systems, comprising of a primer and topcoat. The surface has a high lubricity and the coatings are available in aqueous based forms. PTFE coatings are used for various engineering applications particularly those relating to non-stick (release), low friction, chemical resistance and wear resistance, there are many other solutions that can be resolved by the application of PTFE coatings. Moreover, these industrial grades of coatings are widely used in plastic industries, textile drying rollers, and have excellent non-stick properties. Anar Rub Tech is the leading manufacturer and exporter all kind of a high-quality range of Flexographic Printing Roller. Flexographic rubber rollers product is used in Flexible Packaging Industry machine. Above price may vary as per customer requirement related to sizes ID/ OD and the length depends on cutomer needs.